John F. Kennedy, it turns out, thought well of James K. Polk. The thirty-fifth President’s fondness for the eleventh is one of the lesser revelations, to be sure, in “The Letters of Arthur Schlesinger, Jr.,” published (and possibly lost) last week amid the deluge, the anniversary glut, of Kennedy lit. But the Polk disclosure is, indeed, in its small way a revelation—an insight into Kennedy’s conception of Presidential leadership and, perhaps, into our own, half a century later. The passing reference to Polk, who held office for a single term, from 1845 to 1849, was recorded by Schlesinger, Jr., in a letter to Schlesinger, Sr., dated August 12, 1962. The father—like the son, a scholar—had asked a group of seventy-five historians to rank the Presidents (excepting, of course, the sitting one) as great, near-great, or various shades of not-so-great, and published the results in the New York Times. 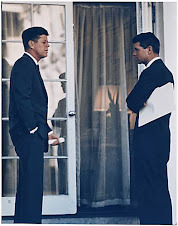 JFK said that he talked a lot but didn’t do very much. He could not see why TR rated above Polk or Truman. What is most interesting is that his criterion is obviously that of concrete achievement rather than political education. People who educate the nation, without achieving all their goals, like Wilson and TR, evidently seem to him to rate under people with a record of practical accomplishment, like Polk and Truman, even if they do little to transform the intellectual climate of the nation. The irony is how precisely this anticipates one of the critiques of Kennedy’s Presidency: that he talked a lot but accomplished little. This is plain wrong, as Alan Brinkley, Robert Dallek, and many other historians have established. Kennedy’s achievements were institutional (the Peace Corps, the space program) and existential (the narrow escape from nuclear war), and his effect on the public mindset, on everything from religious tolerance to public service, cannot (or at least should not) be understated. Yet there can be little denying that fifty years after his death, J.F.K. is remembered more for what he said than what he did, and that his words—and what the Harvard historian Samuel Eliot Morison called “that ringing, virile voice”—have not only outlived but in some ways outdistanced his other achievements. 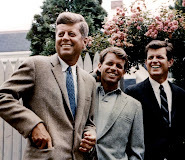 Ted Sorensen, Kennedy’s speechwriter and senior adviser, later reflected that during the postwar period, no other public figure’s “words and phrases [had] become as large a part of our national memory” as J.F.K.’s had. None of this was inadvertent. Kennedy began his political career as an ineffective speaker (one of his early speechwriters complained that after all had labored over a draft, J.F.K. “would not do it justice” at the podium, draining it of life and rhythm), but he worked assiduously at it for more than a decade: studying recordings of Churchill, consulting a voice coach, and devouring, again and again, a volume of great speeches that Sorensen had given him, marking passages for future use. The power of political oratory was, to Kennedy, self-evident. 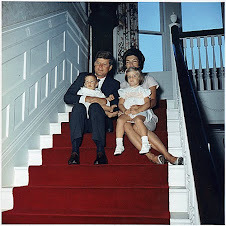 A speech, to Kennedy, had no inherent, incantatory power. He never believed, as romantics do, that oratory is alchemy—that if he got the words just right, he could change water into wine. 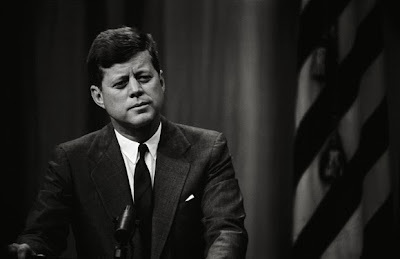 Speech was, instead, an augury, a precursor of action, never a substitute for it, and Kennedy was disinclined (sometimes, as in the case of civil rights, much too disinclined) to say anything until he was ready to do something. Otherwise it was just “talk”—and talking too much, he once cautioned Sorensen, would only bore the public (and, one suspects, Kennedy himself). Kennedy was relieved to learn that Franklin Roosevelt had given few fireside chats. 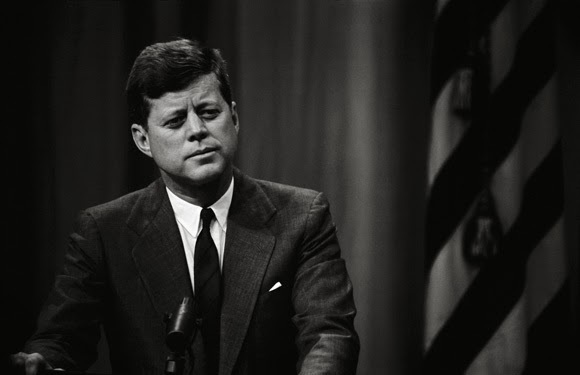 “Words alone are not enough,” Kennedy planned to say that day in Dallas, ina speech he never had the chance to deliver. “If we are strong, our strength will speak for itself. If we are weak, words will be of no help.” Polk could not have said it better himself. In this (as in remarkably few things), Kennedy seems a relic of a distant age. Our Presidents, like T.R., talk a lot. They talk, they tweet, they offer daily color commentary on international affairs, congressional negotiations, pop-cultural events, and national anniversaries. To choose a recent month at random, in October of 2011 President Obama honored the 1985 Super Bowl champion Chicago Bears and the 2011 N.C.A.A. women’s basketball champion Texas A. & M. Aggies, issued statements on the deaths of Steve Jobs and Muammar Qaddafi, proclaimed Leif Erikson Day and National Character Counts Week, and appeared on “The Tonight Show,” among numerous other examples of talking and not doing. This is not to pick on our current President. Consider the one I served, Bill Clinton, and compare his “Public Papers” to Kennedy’s at the same point in their Presidencies, one year in. For J.F.K., 1962—not an uneventful year (Ole Miss, John Glenn, the Cuban Missile Crisis)—fills a nine-hundred-and-three-page volume, minus appendices and the index; for W.J.C., 1994 takes up two volumes, for a total of two thousand one hundred and fifty-nine pages. In fairness, Clinton, like Obama, inhabited a 24/7 news cycle; Kennedy had the benefit of an 8/5 one. Presidents no longer have the luxury of going quiet. For if they do, they create a vacuum their opponents rush to fill—recall the Tea Party Summer of 2010. At the same time, we have strayed farther than we need have from Kennedy’s more restrained, more purposeful use of the bully pulpit. We have allowed the connection between speech and action to attenuate. Arthur Schlesinger, Jr., told me in the late nineteen-nineties that political speech had become “a particularly low form of rhetoric.” What he meant was not simply that the quality of writing had diminished since the Kennedy years, though it had; he also meant that the power of Presidential words had declined as their volume increased, cheapening the currency. Of course, that devaluation is also due to the erosion of faith in the institution of the Presidency (along with the institution of pretty much everything else) in the long wake of November 22, 1963—yet another reason this anniversary has resonance. But “Kennedys don’t cry,” as the family used to say, and neither should we. Let us instead evoke something of the era. 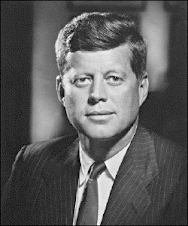 Let it not be Kennedy’s clipped cadence, or the “reversible raincoat” sentences (“Let us never negotiate out of fear, but let us never fear to negotiate”), or the cheap resort to the imperative “let.” Let it, instead, be the idea that Presidencies are above all for practical accomplishment, and that words, by and large, ought to be reserved for moments of meaning. Jeff Shesol, a former speechwriter for President Clinton, is the author of “Mutual Contempt: Lyndon Johnson, Robert Kennedy, and the Feud that Defined a Decade” and is a partner at West Wing Writers. Follow him on Twitter at @JeffShesol.